Construction has been halted at First Solar's 230-megawatt Antelope Valley solar power plant due to air standards issues. 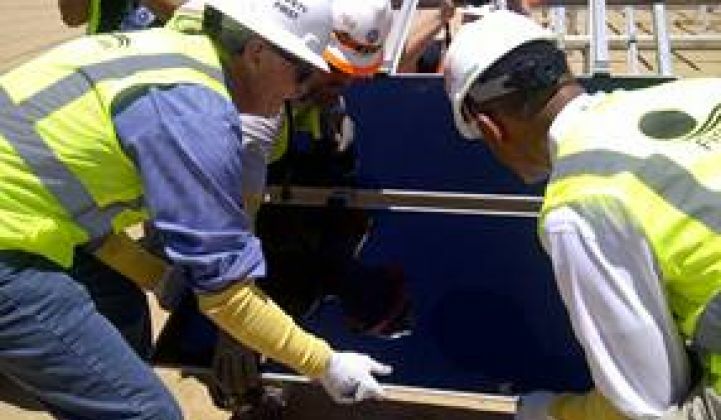 After multiple delays in construction throughout 2012 due to violations of the project’s conditional use permit (CUP), Antelope Valley Solar Ranch One (AVSR1) started delivering electricity to the Southern California Edison grid at the end of the year and now has 150 megawatts of its planned 230-megawatt nameplate capacity on-line. The current interruption of construction is due to the failure of First Solar to bring the facility into compliance with the Federal Ambient Air Standard, according to Antelope Valley Air Quality Management District Operations Manager Bret Banks. 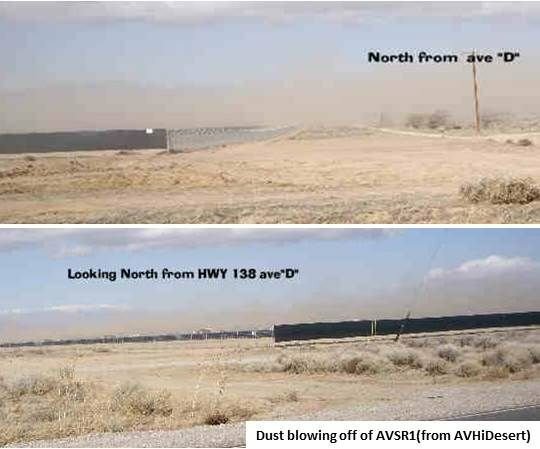 An initial notice of violations (NOV) was issued to First Solar for violations observed April 5, Banks said, and First Solar was advised that close observation would continue, due to increasing seasonal winds and ongoing complaints by residents in the vicinity about dust from the AVSR1 site. 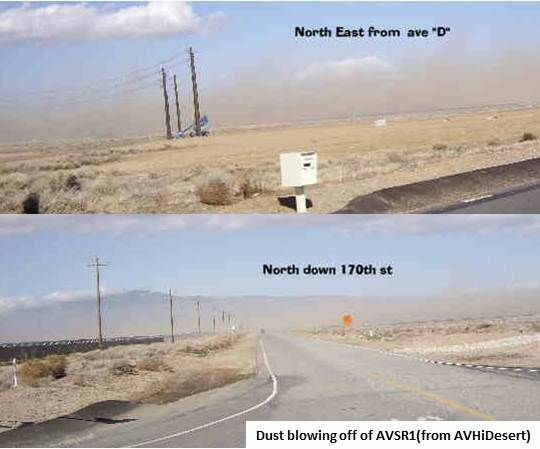 A dust storm in Antelope Valley April 8 was so severe it led to five- and ten-car pileups in the sparsely populated region, as well as closure of the Antelope Valley Freeway. Three more violations were issued April 18 for observations made on April 5 of “a myriad of things [First Solar] could have done that we didn’t think they were doing to prevent the violations,” Banks said, adding that his understanding was that First Solar could not proceed with construction until the violations had been resolved. 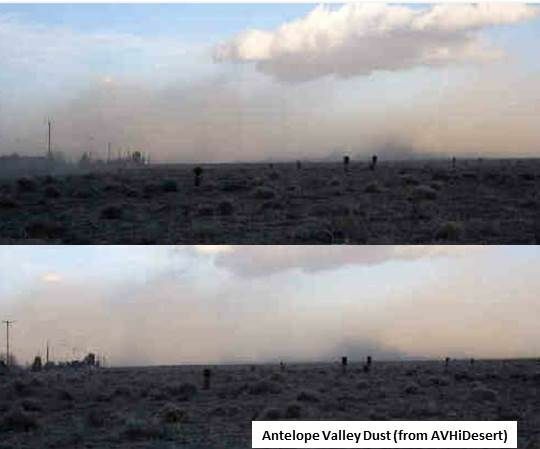 Dust, in general, has led to complaints of respiratory distress by residents and a concern about soil-borne Valley Fever, as well as increased reports of Dry Land Distemper in horses. This is not the first time First Solar’s site management practices at AVSR1 have forced action by the County. Work was brought to a halt for months last spring when the County found grading practices and electrical work that failed to meet the standards set forth in the facility’s permit. NextLight initially acquired the AVSR1 site in the early stages of the rush for Antelope Valley solar project land. It was then acquired by First Solar and ultimately by Exelon, observed Rick Williams, a Project Developer in Antelope Valley for SunEdison (NYSE:WFR) who previously worked with First Solar on projects in the area. “Some sites require more work and some less, in terms of the disturbance of vegetation and topography,” said Williams. “The more vegetation, the more disturbance is necessary to prepare the site for construction and, consequently, more effort is required to manage dust."